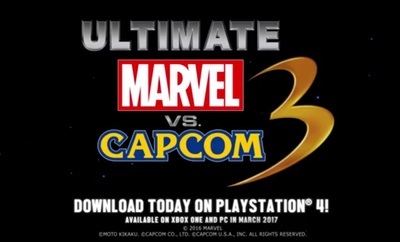 Ultimate Marvel Vs Capcom 3 is a fighting game developed by Capcom and Eighting. It was published by Capcom. It was originally released in 2011 for the PlayStation 3 and Xbox 360. This trailer is for the game's re-release for PlayStation 4. Subsequent releases for Xbox One and Windows Computers are scheduled for March of 2017.